Lately, from various people there seems to be some interest in the Series 3 R33 GT-R. For those who don’t know what a Series 3 is, the informal nomenclature refers to the 1997 and 1998 R33 GT-R models, ie the last 2 years of production. During its production, the R33 GT-R evolved, with various (mostly cosmetic) changes being made both for the 1996 model (Series 2), as well as the Series 3 models. I was going to write only about the Series 3 on this post, but decided as I was writing this that it would be best to highlight all of the changes throughout the production, to demonstrate the differences clearly. Obviously, the Series 1 (or “zenki” [前期] model in Japanese) is the R33 GT-R in its original form. 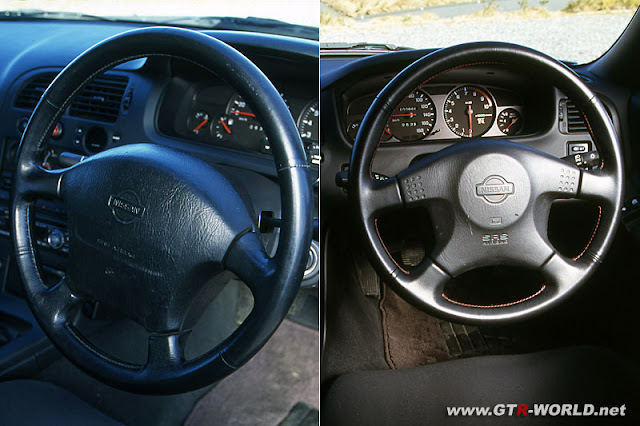 Introduced for the 1995 model year, the comparisons being made at the time were naturally against the R32 GT-R (how it was larger, heavier, but faster and better handling, etc). It is important to note for all R33 GT-R fans that, it was this zenki model R33 GT-R that set the under 8 minute record at Nurburgring. The modifications made later are obviously not those that required significant capital and resources for Nissan to implement. Which really is another way of saying that the Series 1 models were so good that, most improvements in the Series 2 and 3 were really only cosmetic! Note: These numbers I copied out of GT-R Magazine. Don't ask me why they don't add up! 4) Elimination of the Active Sound System that came with the R32’s stereo. 5) ECU changed from 8 bit to 16 bit. 7) Changes to the rear finisher (the “Skyline” lettering under the trunk is more pronounced). But then in 1997, Nissan made more than a few improvements to the R33. 2) Larger front lip spoiler (an additional 20mm) – (but with an option to order the shorter one from the earlier models). This also means larger brake cooling ducts. 4) Left side turn signal “grill” is cut out for maximum airflow to optional oil cooler. 5) ABS braking system actuator unit is smaller, with reprogrammed logic to improve stability in braking while cornering situations. 9) All glass received an anti-UV coating. 12) Additional bracing in the trunk rear floor area attaching the rear suspension mount to the floor in order to improve the car’s rigidity. Said to be the equivalent of adding another strut tower bar, and also has the added benefit of strengthening the rear crumple zone. Available colors were the same as for the Series 2, except there was no BT2 color. So I think that's it! IF I missed something, please let me know. OR if there is a photo of something that should be added here, let me know! Thanks for that Aki... I didnt know about the brace added to the boot in later models! no problem! Looking forward to more entries on your blog! Very informative Aki, well done!! Great post, full of 'lost' and hard to find information I really enjoyed it. Good summary of the differences. I'm a self-confessed R33 geek but there were some new ones on me there! Thanks everyone! Let me know if there are other R33 minutiae you'd like me to research, happy to give it a try! I really hate my steering wheel. It's just so damned big and bulky. Much rather have the late model one. Nice work, as usual, Aki. 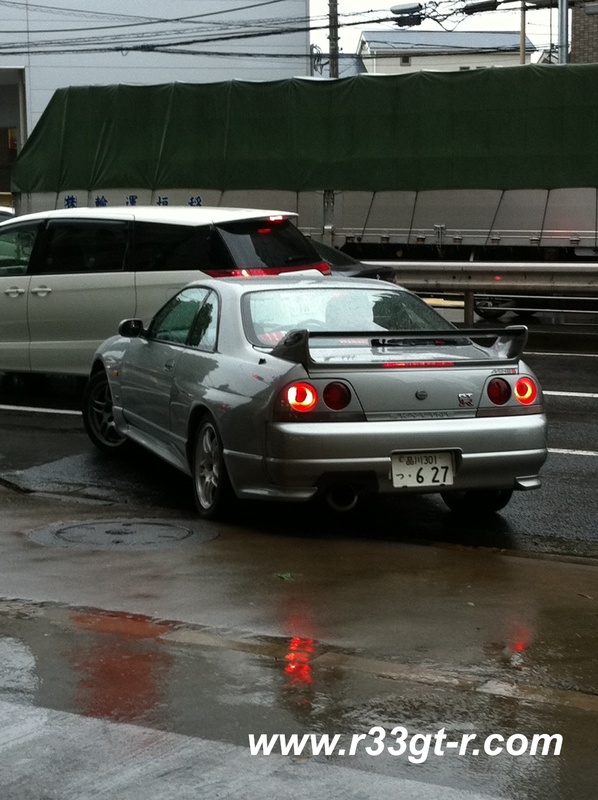 There were some of the last R33's that were the R34 Black. GV1. One of them is here in the US. Now- find out how many N1's they produced. No real numbers on the R33's. I have seen one here in the US, but no one can give a real answer on them. Sean -thanks buddy for the reminder, I knew I was missing something. Will post and credit you. As for N1s, believe me I have been researching this, no one even at Nissan seems to know! I have asked a few people about the N1 R33's, but nothing. R32 is well documented, R34 is well documented. R33 is unloved. You R33 guys are lucky you have Alexander Gordji, ha ha. He is a real R33 enthusiast. I have some unpublished articles from him on R33 N1 racing, and Group A R32. One of these days I should edit them and post them. An I still wonder why the N1 cars were based on the heavier Vspec cars. I track use my R33 an looked fr a non Vspec on purpose - for it's plain old mechanical LSD. Sean - I know of Alex from his Nissan GT-R book, but did not know he was an R33 guy! Will have to figure out a way to contact him! Maybe he will be kind enough to let me publish on this blog (on a separate page, maybe) an excerpt from his articles? very interesting, it appears you may have a custom job! I don't suppose you have a link to a photo so we can take a look? To answer your question however - from the FACTORY, the series 3 was the only one with the rear fog light. Where is your switch for the foglight located? On the series 3, for some odd reason it is located on the lower part of the instrument panel, right above your left knee. To be honest, I just found it after reading your post. I'm out of town until tomorrow, so as soon as I get back ill post a link. Very cool ryandh! So where is the switch to turn it on, located? Located the same place as the series 3, but it definitely seems like a custom job. Aki - do you know if the Super Taikyu cars were based on the Vspec or standard car? I wonder if any of the racing versions had the active rear diff? My guess is no (other the actual N1 series)... Why would you want the extra weight and complexity on a race car? The Super Taikyu series cars were all N1 spec cars. In Japanese, the series is the N1 Super Taikyu, and the regulation rules pretty much stated that the cars had to be near identical to cars sold on the market. Hence no aero mods, etc. In which case, you would want the most high tech car, no? Yes, more complex, but every advantage counts, and at a weight penalty of only 10kg, probably worth it. Also, the ATTESA ETS-PRO was rated to handle up to 600ps, so durability was probably ok. But I will ask some pro drivers next time I meet with them. Great site Aki - I've been following some of your discussions on gtr.co.uk/forum. I was intrigued with your rear/boot floor brace find. Can you really see them doing mnuch in your opinion? I've had a quick look at my 95 v-spec import and I can't see the mounting points giving vast improvements unless I've mixed the brace points (it was dark and using a phone light). Keep it up (it's keeping me interested in the 33 with "new" extras like the courtesy lights on the outside - nice touch). Dave - thanks for the accolades! 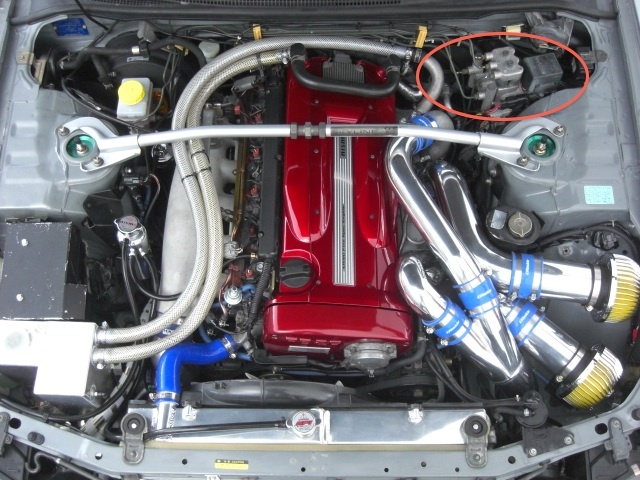 Re the mounting points, if you read my latest entry (http://www.r33gt-r.com/2012/04/r33-vs-r34-gt-rs-continued-objective.html) the article talks about how the R34 had better body rigidity. What I didn't bother translating/explaining was, the article described how Nissan in 1996 began working on improving the chassis rigidity. They built a chassis test car, which was based on the BCNR33, and began various experiments to increase the rigidity of the car. I SUSPECT that during these tests, they realized that one very simple way to increase rigidity in the rear was to add those two braces. They don't intrude on trunk space. BTW the R34 has ANOTHER brace in the trunk, a bar mounted laterally in the rear of the trunk in front of the headlights. But, as the article said it was tough to get the correct amount of rigidity front AND rear, in a balanced way. So I suspect that the added braces were good to add just the right amount of rigidity to the rear. Anyway I plan to delve into this a bit deeper, as some of my upcoming additional mods will involve further body bracing. oops not headlights, I meant taillights of course! Thanks Aki - I've sourced some rear boot floor spaces so will try to keep you posted on fitment (running/testing might be longer as I'm mid way through an overhaul). PM me your address for pics on gtr.co.uk/forum if it will help. This has been very interesting for me having just purchased a series 3. On the subject of the front bumper, my car differs from yours slightly, but I believe it is "factory"
My car has the factory oil cooler option and has a intake panel (sourounding the turn signal)and side exit from the cooler. It is similar to the Middlehurst UK cars but not exactly. See you around the GTROC!! Do you know anything about a bolt in the front right inner guard?? My new rims and tyres rub when im almost at full lock turning left but no bolt in the left guard?? No, sorry - I would have to go take a look at mine... actually ever since I upgraded to 18 inch 265 tires, my front right wheel rubs on full lock too. What size tires are you running? Wow, awesome work. I really love all the info here. Thanks for the nice comments! Pretty sure you can buy and retrofit the pieces, although I have not done it myself. On occasion I see them pop up on Yahoo Auctions here in Japan. Not sure if you can buy directly from Nissan, but if you can get ahold of these pieces, should bolt right on, although some drilling might be required. Are all the Series 3's V-SPECS ? - Ive seen 1 or 2 without the V-SPEC on the rear. No Duane, Series 3 had both V-Spec and standard models. I have a Series 1 R33 GTR V-spec from jan 1995.
there is no way for me to store my cd's upright in the center console because of the airbag computer. mine doesnt have the rear wiper and has a workin fog light. pretty sure the fog light is a custom job though. Yes you are right! The Series 1 cars had passenger airbags as factory options. As was the rear wiper delete! So you have a pretty special car there! Thanks for reading and your comment! Thanks for the comment. The rear fog light switch is only operational when the headlights are on - if you dim the headlights, then the rear fog needs to be turned on again. Otherwise it will stay on as long as the headlights are on. Hey Aki i just bought a 1996 BCNR33 GTR but the strange thing its a series 1. No-airbag, coin holder, CD's fit up right up in the arm rest and dash material is series 1. Don't know the production date jet, will check that when it clears customs. I have a rear foglight and seems to be a switch on the centre console. But that switch has no plug on it, and when I remove the centre console, there is no plug there anywhere. It's a Series 3 1997. How do I find this plug> What could have happened as it looks like it's nowhere there. Any info on colours or where the wiring leads to and from? Hi. Nice write up. Very useful. I have just bought a May '96 car, series 2, I guess, it has the smaller steering wheel and passenger airbag etc. It also has N1 vents and xenon headlights which appear to be factory fit, do you know if these were optional extras for the S2? Thanks for your efforts. I have a question regarding the rear fender width/arch, could you confirm or find out if all series have exactly the same dimensions? 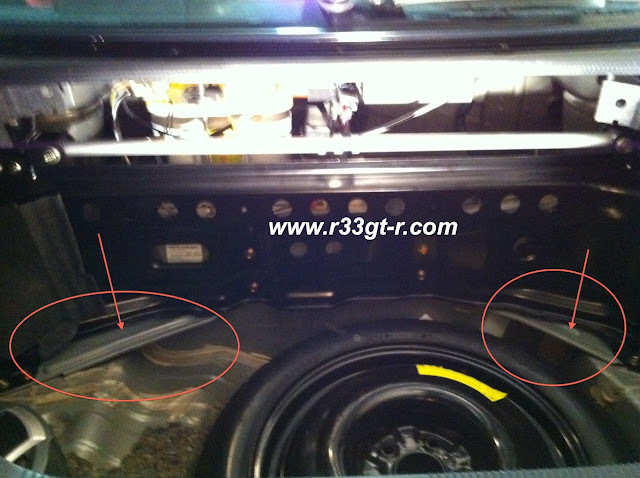 Appearntly, some R33s can fit 18x10.5 +15 with ease, some cannot and the wheels stick out. I'm not sure why, but I believe in Japan they do fender rolling in the rear and modify the guards in front to run wide wheels with no scrubbing issues. I'm sure you can across this before, I'd appreciate your clarifications. Ali from Saudi. The Xenons were not available until the Series 3 came out, so doubtful. The vents though were on the N1 cars so it's possible your car has an N1 bumper. Hope this helps! I don't think there is a difference amongst the models. That size should not be a problem especially in the rear even if the fenders are not rolled, if running a relatively normal height. Yes you can remove the liners and such but it's also how low the car is. Hi Aki, I talk to you on speedhunters and I realise you´re the R33 guru maybe you can help me with a couple of questions I have, please. 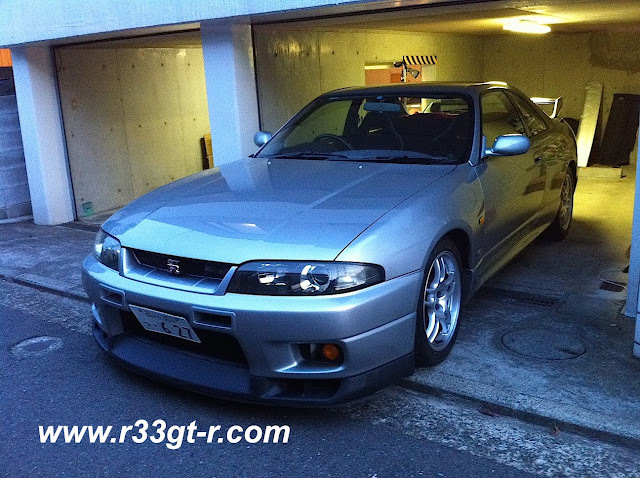 1st: What´s the difference between a S1 and S2 R33 GTR? 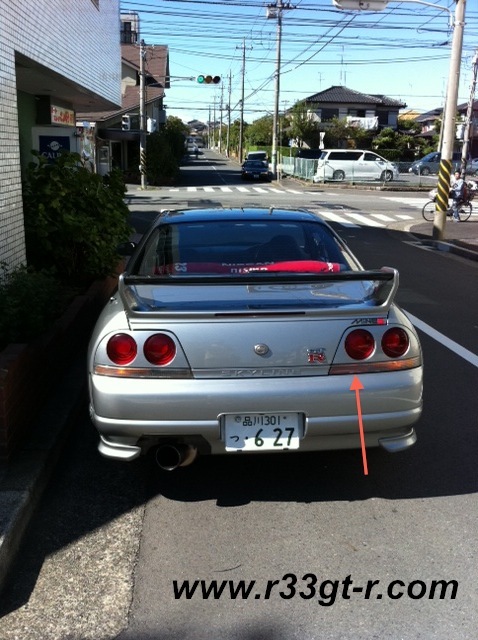 2st: Did Nismo made a diffuser for R33 GTR? Since 400r rear bumper is a bit longer than the original there´s no other brand like Top Secret who make this. 3rd: Can you put some images about the antenna switch position? I cant really understand much about it. Whats the differance in the r33 skyline 4? 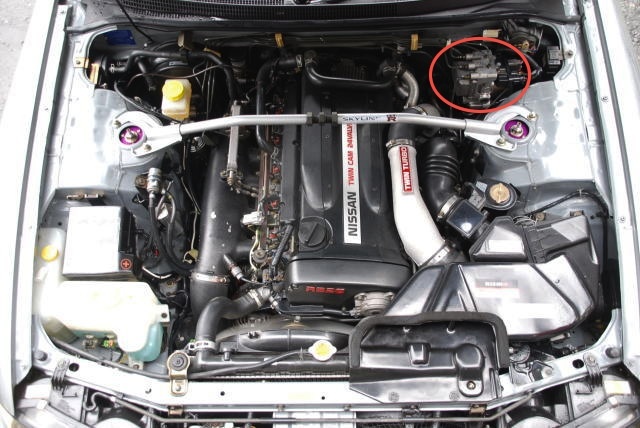 There was a mod on the series 3 R33 that you didnt mention ,,They modified the gearbox syncro hubs , they made some larger ( 5th gear )and changed the weak spring clips for solid dog type locks on the 3/4 syncro, I fitted an OS Giken 5 speed cluster and they specify using the late model syncros they give you a list , the alternate parts are also listed in the r33 parts book, it is quite a few parts that are changed . @Den - yes, you are absolutely correct! I forgot about that. In fact, most 33 owners will specify Series 3 gearboxes as replacements when theirs break. I will have to update the article above (and full credit to you!) soon. Possible to upgrade from S1/S2 ABS to Series 3? I am too much happy. Aki, the V-spec also had the addition of plastic air direction plates the bolt onto the radius rods, also I believe the N1 model came with different wheels as when I purchased mine ( not an N1 but s3 V-spec ) it has 17x9 +8p enkei RPO1 that has in the canter oc the wheel " racing model for bcnr33 N1 ".